It is possible to transfer from the active duty ranks to the National Guard or Reserves. In fact, the road is paved quite nicely to make that transition almost seamless. However, to be a Reservist in any branch of service or National Guard, it is quite difficult to transfer into the active duty status. It actually can take months to process. A reservist or guard member must first be released from their reserve status and basically apply to join the active duty ranks. That means finding a recruiter to assist you with the processing into the military (active). The Guards, Reserves, and Active Duty components are all different. With very few exceptions (mostly for medical professionals), one cannot simply transfer from the Reserves/Guard to active duty. One must get an approved discharge from the Reserve/Guard component and then separately process for enlistment (or commission) for an active duty service. Exception: Some Army Reserve and Army National Guard soldiers who are currently activated can apply for direct transfer to active duty. However, one may apply to the Reserves and/or National Guard for a "conditional release." Basically, a "conditional release" says that the Reserve Component. or National Guard agrees to release you from the remainder of your commitment if you are accepted for enlistment or appointment to an active duty service component. Regardless, the process is still long. See the official process here. Meet with an Active Duty recruiter - To start the conditional release process, you must see an active duty recruiter. Get a DD-368 signed by the recruiter (this is a conditional release form) - The Recruiter is the only person who can request a conditional release. He/she does this by submitting a DD Form 368, Request for Conditional Release. This form must be signed by the member and the active duty recruiter. Speak with your Chain of Command, and get their support - It's important to realize that a conditional release does not have to be approved. It's entirely up to the Guard/Reserve component. If your unit or component is undermanned in your particular MOS/AFSC/Rating, they may disapprove the conditional release. It's also important to understand that this is not necessarily a fast process. So, it's important that you allow plenty of time for the DD Form 368 to make it through the review process. Submit DD-368 along with your entire military record to your unit. Your packet with your DD-368 will be moved up the chain of command to the General level. Be prepared to wait for months. Plus, it is not a bad idea to make duplicate copies of everything as there are always stories of the chain of command losing the package. When your packet reaches the final approving authority, you will soon learn your fate. If the command approves it, you have a conditional release to join active duty. If the command denies it, you are staying in the Reserves to complete your contract. If the conditional release is approved, you may then enlist (through the active duty recruiter) as a "prior service candidate." (Or apply for OCS/OTS). This is true, unless you have not yet been to basic training as a Guard or Reservist. If you've not yet been through basic training, and you get a conditional release approved, normally you are enlisted active duty as a non-prior service candidate (which offers more enlistment options). If your conditional release is approved, you will normally still be required to drill with your Guard/Reserve unit, until you actually go onto active duty. Unfortunately, prior-service candidates are among the lowest on the recruiting priority totem pole. Recruiters do not get enlistment credit for enlisting prior service candidates (i.e., prior-service do not count against their recruiting quotas). Therefore, some recruiters are not all that excited about doing all of the paperwork (including the extra paperwork it requires for prior-service candidates) for a recruit they don't get credit for (Many recruiters would rather spend their very valuable time working with non-prior-service accessions because those recruits are counted against their enlistment quotas). For complete details, see Prior Service Enlistments. Prior-service recruits don't get all the enlistment incentives available to non-prior-service applicants (Exception: Some services offer prior-service re-enlistment bonuses for prior-service who are already qualified in certain acute shortage jobs). 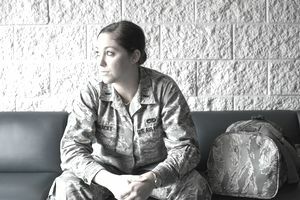 Usually, if a prior-service recruit has an MOS/AFSC/RATING that directly converts to an MOS/AFSC/RATING of the active duty service they are trying to enlist in, and if the service has a current need for personnel in that MOS/AFSC/RATING, then it is mandatory that the recruit enlist in that specific job. If the applicant is certified in a job that is not currently in need by the active duty service they are trying to join, or if they have a job that does not cross-relate to the service they are trying to join, only then may they enlist into a different job. Conditional Releases are approved for a period of six months. If an extension is required, an additional three months may be granted. A copy of the Oath of Office or Enlistment contract should be returned to the losing component within the specified time frame.